Wouldn’t you know it, this particular hawk I was following, landed in a tree in one of these beautiful pastures that was located behind a beautiful house. Lucky for me, I have a pretty impressive zoom lens, so I was able to get some pretty decent pictures from my car! After taking a few shots, I decided to review them on the back of my camera, and I noticed what looked like a nest off in the corner of one of my shots. Look carefully, and you can see a little fluff ball next to the Momma! So cute!! Not only was there a nest, but there were a few babies in it! Oh man…this was going to be fun! I took many photographs, but I was so far away, they didn’t turn out like I had hoped. I quickly called my husband and told him that I needed a Canon 600mm Fixed Lens so I could get some pictures of this hawk’s nest. Of course, as I expected, he just sort of laughed and said “Um…no.” So…my dinky little Canon 100-400mm Zoom Lens would have to do. This past week, I decided to go check on my little feathered friends (on my way to lunch) to see how big they are getting, and to see if I could get some pictures of the babies. As many of you know, a hawk’s nest in Lucas is not really on my way to lunch, but I had some extra time, so it worked out for me, because it just so happens that there is a Wendy’s (my preferred lunch location) in Lucas, right down the street from where I saw the Hawk’s nest! Here she is – – watching her next from a nearby tree branch! Can you see the nest in the bottom left side of the picture. Just look for the little fur ball sticking his head up! 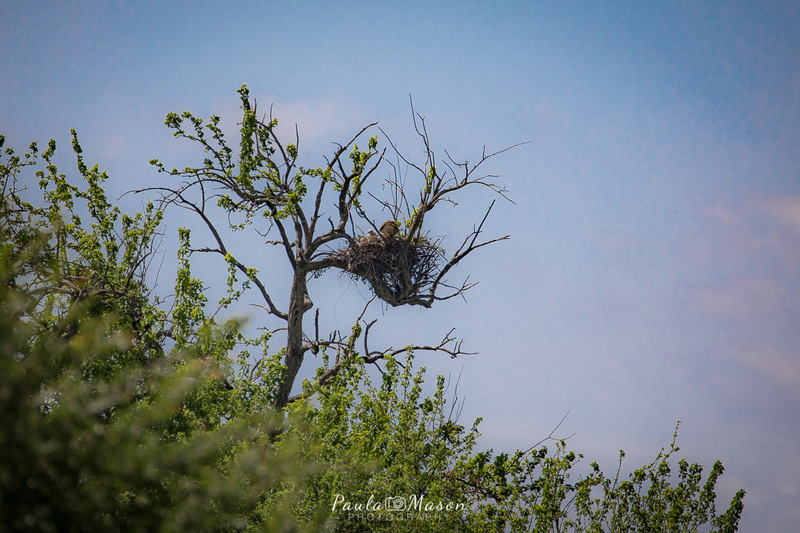 It didn’t take long for me to find the nest, and through my zoom lens, I could see a couple of the baby hawks sitting up and moving about in the nest. Just off on a nearby branch, the mom sat keeping an eye on her babies. I got lots of pictures, but like I said before, the nest is so far from the street, that the pictures are not as sharp as I’d like them to be. This is where the private property part of my story comes in to play. 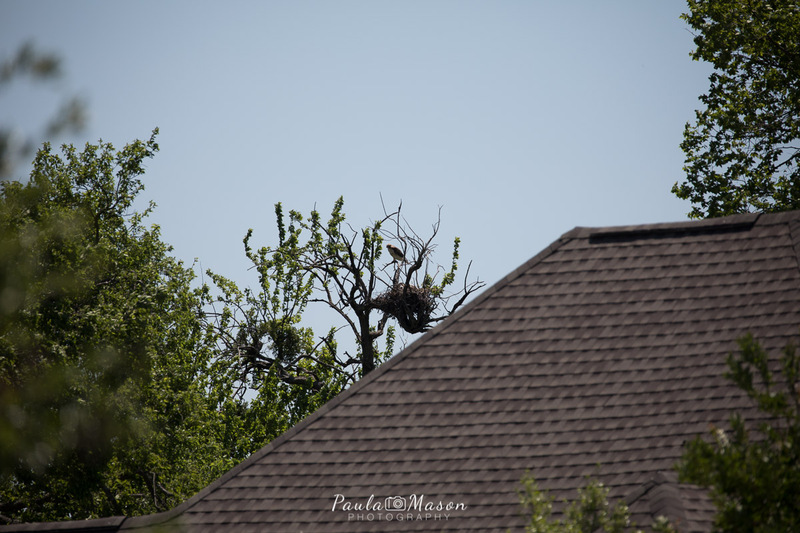 I circled the neighborhood hoping for a better (and closer) view of the nest, and as I slowly cruised down one of the other streets, I got a great glimpse of the nest. I was determined to get a decent picture, so I parked my car on the street and hopped out with my giant camera in hand. Those of you who have seen my camera, know that it is not one you can easily hide. Oh well…anything for a great photo, right? Here I was, creeping between two houses along their tree-line trying to get close to this hawk’s nest, carrying my giant, impossible to hide camera. I got up pretty close to the pasture fence, and I was just getting my camera aimed at the nest, when out of nowhere, a giant blood-hound type dog began barking at me. Oh my God….I had been so focused on getting to the nest, I had not even seen this dog in his yard. Luckily, he was fenced off, because he was not happy that my camera and I were on his property. Can you imagine having this cool nest right out your back window? Well…this is the roofline of one of the houses that I was creeping between with my zoom lens. Unfortunately, from this side, there is a tree blocking the view when you get close to their backyard! It didn’t take long for this blood hound’s bark to alert every other dog within a 5-mile radius of my presence! Oh boy… Let the fun begin. I began a very quick trek back to the car, and on the way, I encountered a giant Lab, 4 Yorkies, and a Jack-Russell Terrier all very unhappy to see me! Fortunately, the lab and the Yorkies were behind a fence, and the Jack Russell must’ve had an electric fence of some sort, because he was just roaming around the edge of his yard, barking like crazy! I kept waiting for him to charge, but I made it to my car safely! The volume of their barking was amazing, and I’m surprised everyone did not come out onto their porches to see what in the world was going on. I quickly hopped in my car a sped off. So beautiful when they are in flight! When I got home, I saw that I had some decent pictures, but certainly not what I had hoped for. Good enough to share though. So…I sent one to a friend who I knew would be able to identify the hawks, and sure enough, she did. I had discovered a nest of Red-tailed Hawks. The Red-tailed Hawk is probably the most common hawk in North America. 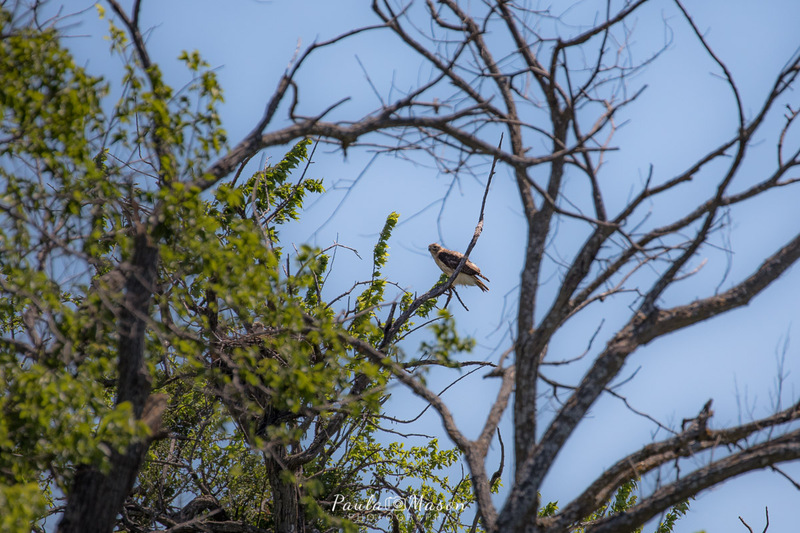 Red-tailed Hawks like to soar above open fields, and sometimes, you will see them atop telephone poles, looking towards the ground to catch the movements of rabbits or other small animals they like to snack on. 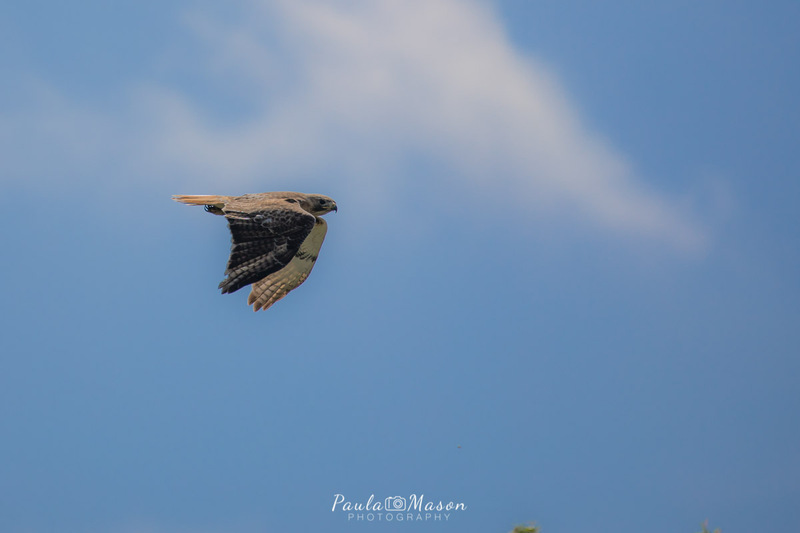 Of course, after she identified the hawks for me as Red-tailed Hawks, she casually mentioned how nice it would be to get a close-up shot of the babies. Well…yes it would I thought. But how? I suggested that she come with me and knock on their front door and politely ask if we could go into their yard and climb their tree to snap a photo of the baby hawks. I would happily do the tree climbing and photo taking if she would just knock on their door. Well…she did not go for that, so I have a 600mm zoom lens coming in the mail next week that I rented from ATS Rentals. Or, if you prefer to rent locally, you can try Camera Stop in Plano! If you ever want to try a lens out, these are the places to go! You can read all about Red-tailed Hawks on the All About Birds – Cornell Lab of Ornithology Website. While I was reading up on them, I came across some interesting facts I thought I’d share with you. The “Harlan’s Hawk” breeds in Alaska and northwestern Canada, and winters on the southern Great Plains. This very dark form of the Red-tailed Hawk has a marbled white, brown, and gray tail instead of a red one. 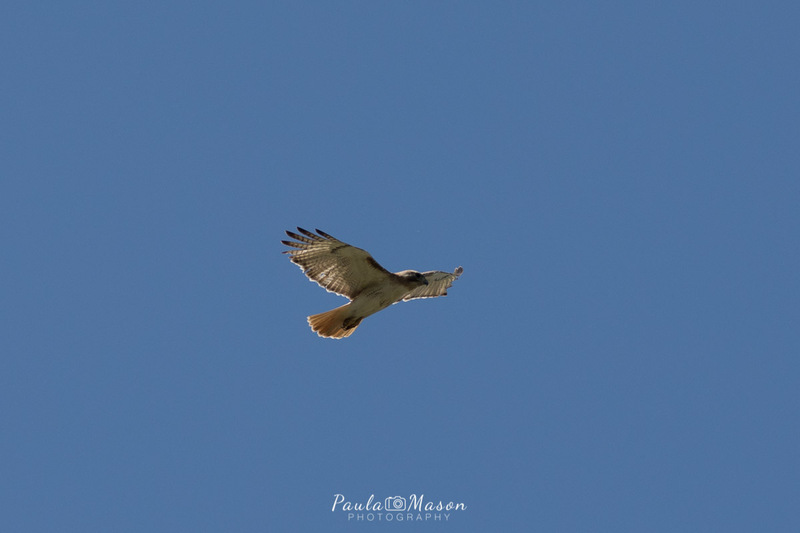 It’s so distinctive that it was once considered a separate species, until ornithologists discovered many individuals that were intermediate between Harlan’s and more typical Red-tailed Hawks. NextCattle Egrets in Allen? What?